The definition of being organized is that you know exactly where you can find what you are looking for. For the most part, I am, even though it might not be apparent to one who walks in my studio. Other than tax documents, the most organized area of my life is color. 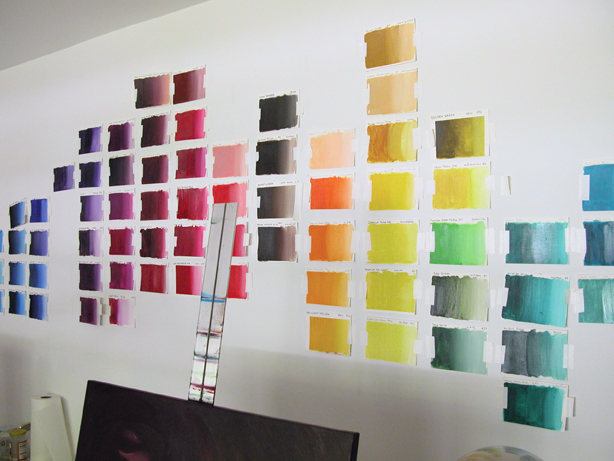 My oil paint swatches wall gives me the space to stare at colors in relation to other hues for long periods of time. Each swatch gradates from the purest version of the color on the left to a tint lightened with white on the right. I organize my colors with chromatic meticulousness in every medium I work in (beads, colored pencils, oils, acrylic, pastels, markers… the list goes on). I do this not only because I thoroughly enjoy it and it allows me to understand the hues in relation to other hues, but also because it allows me the freedom to make stronger color choices more easily. Sometimes students bring in all their colors to show me: they’ve piled every hue, value, intensity and shade are in the same container. No wonder they are intimidated by color. Its overwhelming to look at and try to make sense of. Overwhelming and exhausting. When colors are organized in a logical fashion, the intimidation factor dramatically drops. When your eye sees order, your mind can think more clearly and can make more informed choices. When colors are organized chromatically, I see blocks of hues first: yellows, oranges, reds, violets, blues, greens. Within the blocks of hue I arrange according to value and intensity as best I can. Now I can see clearly what is available and can easily pick the tones I want to experiment with. I guess I could just have less beads but we all know that is not an option!! Karyn, you’re right, less beads is NOT an option! LOL! I’ve been having the same issue: size vs. color. 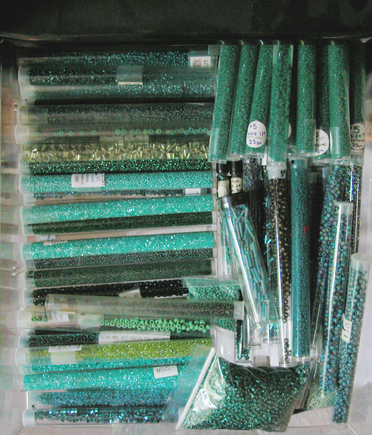 The beads that I own the most of (size 110 and Delicas) get sorted by color. Delicas have their own multi-drawered unit, seed beads their own as well. Smaller sized get grouped by sizes.